If you love the outdoors and traveling this backpack was made for you! You'll never want to leave home without your backpack cooler from GigaTent. Stay nourished and hydrated during hikes and rock climbing. You'll easily be able to cool yourself down and get some much needed fuel during intense physical adventures under the heat of the sun. 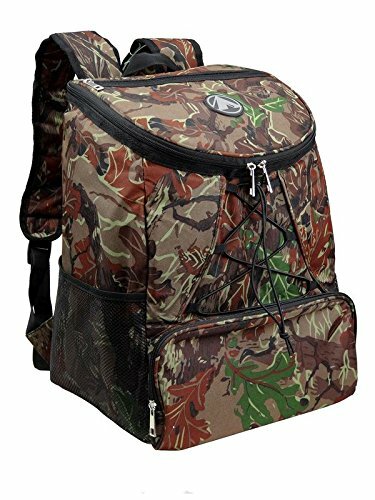 All of your outdoor activities will be even better with this backpack cooler. Camping, BBQs and road trips are made easy as you can easily pack meals and refreshing beverages that will stay cool all day and night. College students can use it to carry drinks to parties, parks and study groups. Bring it to the kid's sports games and give them something to cool down with or bring beverages for the family to enjoy as they cheer the team on! It also can become a quintessential accessory for theme parks and music festivals. Multiple compartments and heavy duty zippers create superior storage for all of your daily essentials. A large front zipper pocket, top zipper pocket and two side mesh pockets make it easy to quickly access whatever you may need on the go. You can easily store your bag as it folds down to half its size. Store it in your car or luggage. This backpack is great for packing lunches. If you work for long periods outside you'll be able to keep your meals fresh and ready for you when you get a break. Get the most comfortable, high quality, lightweight backpack cooler around!